Forget everything you’ve ever been taught about free speech in America. There can be no free speech for the citizenry when the government speaks in a language of force. What is this language of force? This is not the language of freedom. This is not even the language of law and order. This is the language of force. This police overkill isn’t just happening in troubled hot spots such as Ferguson, Mo., and Baltimore, Md., where police brutality gave rise to civil unrest, which was met with a militarized show of force that caused the whole stew of discontent to bubble over into violence. A decade earlier, the NYPD engaged in mass arrests of peaceful protesters, bystanders, legal observers and journalists who had gathered for the 2004 Republican National Convention. The protesters were subjected to blanket fingerprinting and detained for more than 24 hours at a “filthy, toxic pier that had been a bus depot.” That particular exercise in police intimidation tactics cost New York City taxpayers nearly $18 million for what would become the largest protest settlement in history. Demonstrators, journalists and legal observers who had gathered in North Dakota to peacefully protest the Dakota Access Pipeline reported being pepper sprayed, beaten with batons, and strip searched by police. More recently, this militarized exercise in intimidation reared its ugly head in the college town of Charlottesville, Va., where protesters who took to the streets to peacefully express their disapproval of a planned KKK rally were held at bay by implacable lines of gun-wielding riot police. Only after a motley crew of Klansmen had been safely escorted to and from the rally by black-garbed police did the assembled army of city, county and state police declare the public gathering unlawful and proceed to unleash canisters of tear gas on the few remaining protesters to force them to disperse. To be clear, this is the treatment being meted out to protesters across the political spectrum. The police state does not discriminate. A militarized police response to protesters poses a danger to all those involved, protesters and police alike. In fact, militarization makes police more likely to turn to violence to solve problems. It’s hard to overstate the pure evil and tyranny Google has engaged in by wiping NaturalNews.com off the internet. Not only has the attack on the free press and REAL NEWS been taken to the next level with this move, but this assault on FREE SPEECH will undoubtedly COST LIVES. The valuable catalog of information about health and wellness which Natural News provided, some 140,000 pages of articles and research have been scrubbed. As Mike Adams has said, this is a modern day book burning. Happy Fourth of July — Independence From What Though? The Fourth of July is and was a world-changing event. Our Founders declared independence from Great Britain after the Crown and Parliament refused to hear our petitions, restore natural-born rights to the colonists, and occupied colonial towns with demonstrations of force. In addition, the Continental Army fought against the British for over a year before the Declaration of Independence was officially announced. The assertion of sovereignty over our own affairs happened 240 years ago, and now we have had many of the same infringements on our liberties that our ancestors did. Some in fact are even worse. Posted on July 5, 2016 July 9, 2016 Categories Big Government, Civil Rights, News, Second Amendment, TyrannyTags 240 Years, 4th Of July, American Revolution, Big Government, Bill Of Rights, Britain, CA, California, Civil Liberties, Civil Rights, Federal Government, Founding Fathers, Free Speech, Great Britain, Gunpocalypse, Independence Day, Parliament, Redress, Second Amendment, Self Defense, The Crown, Thomas Jefferson, Tyranny, WashingtonLeave a comment on Happy Fourth of July — Independence From What Though? Perhaps the greatest irony of this past year has been the mind numbing and irrational anti-free speech wave that swept across facets of so-called “liberal” America. This regressive movement was most readily apparent on college campuses, where hordes of sheltered and emotionally stunted students demanded restrictions on free speech in order to prevent themselves from being offended by an ever expanding list of unhappy thoughts and words. However, what is far more troubling, albeit much less public, are attempts by two fascist academic authoritarians, to convince the American citizenry to relinquish their First Amendment rights in the name of fighting ISIS. One of these men is a close advisor to President Obama. It seems everywhere you turn, U.S. politicians at all levels of government are incessantly scheming to figure out ways to further erode the civil liberties of the American public. Earlier this month, a particularly egregious example emerged from the state of New York. 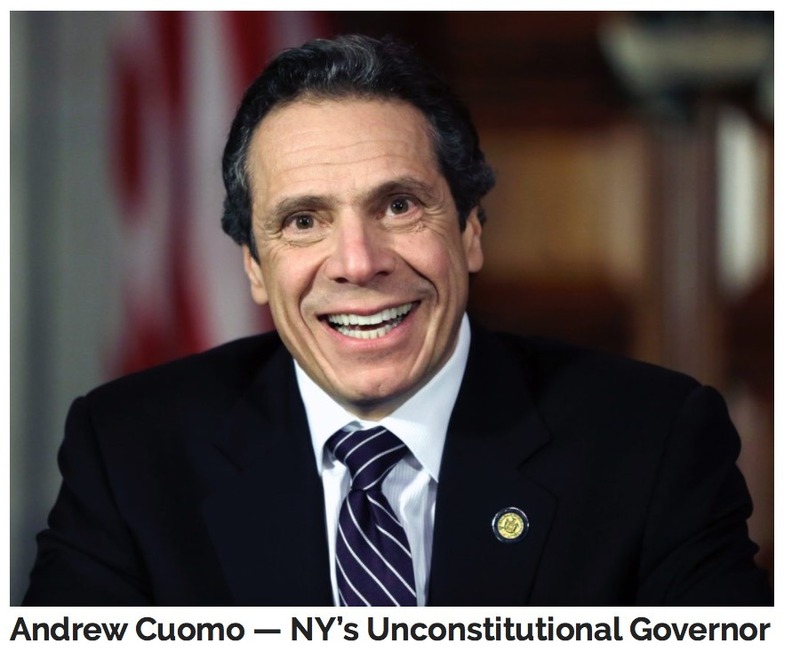 It relates to an anti-First Amendment executive order issued by Governor Andrew Cuomo, followed one day later by similar legislation introduced by a state Senator. In case you aren’t up to speed on the issue, here’s a little background.